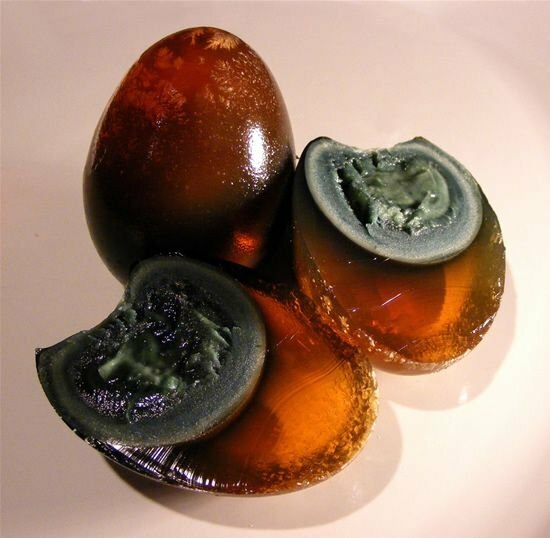 Century egg, also known as preserved egg, hundred-year egg, thousand-year egg, and thousand-year-old egg, is a Chinese cuisine ingredient made by preserving duck, chicken or quail eggs in a mixture of clay, ash, salt, lime, and rice hull for several weeks to several months, depending on the method of processing. 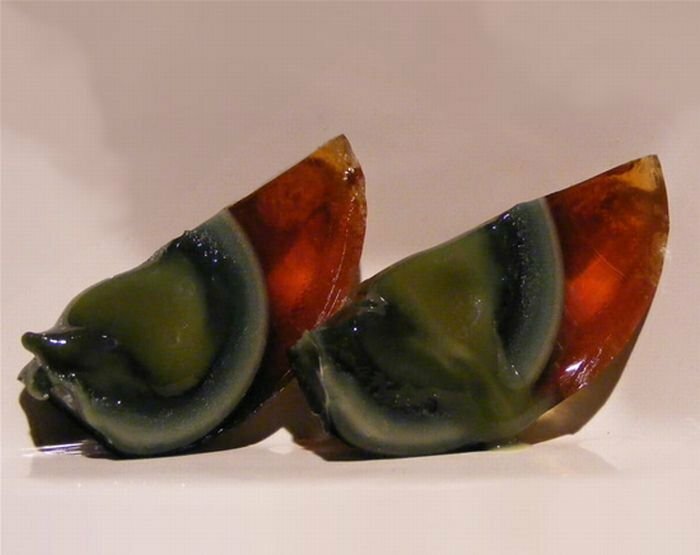 Left: Century egg sliced open. 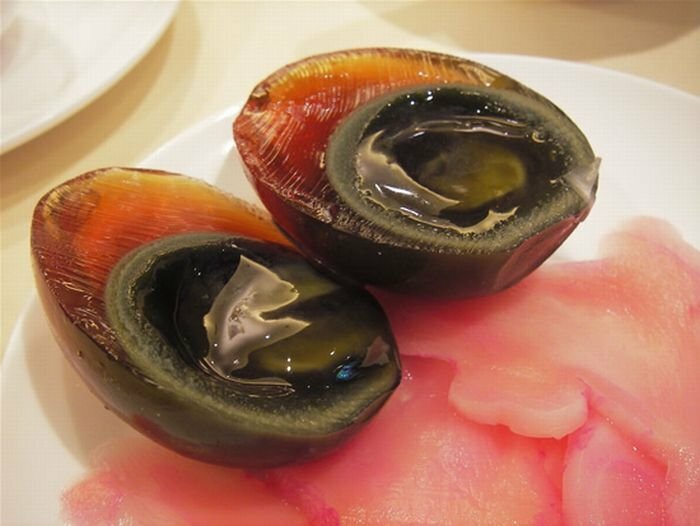 After the process is completed, the yolk becomes a dark green, cream-like substance with a strong odor of sulphur and ammonia, while the white becomes a dark brown, transparent jelly with little flavor or taste. The transforming agent in the century egg is its alkaline material, which gradually raises the pH of the egg from around 9 to 12 or more. This chemical process breaks down some of the complex, flavorless proteins and fats, which produces a variety of smaller flavourful compounds. Some eggs have patterns near the surface of the egg white that are likened to pine branches or snow flakes (see photo gallery below). 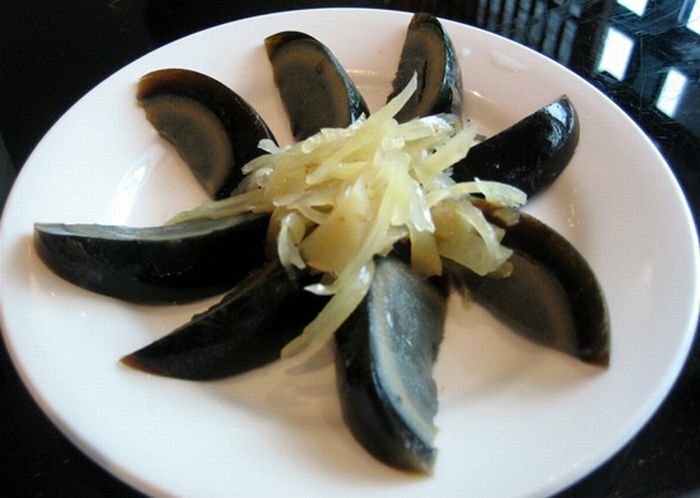 According to some the century egg has over 5 centuries of history behind its production. The origin of the method for creating century eggs likely came about through the need to preserve eggs in times of plenty by coating them in alkaline clay. 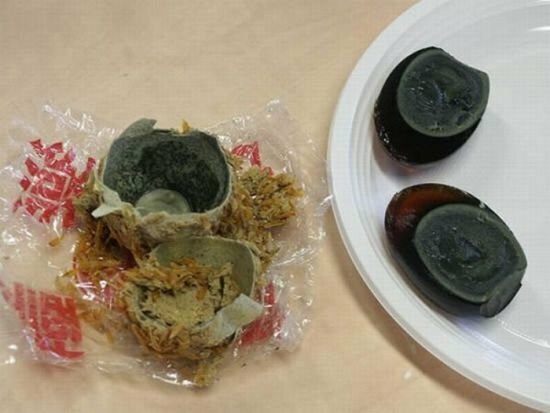 Left: Century egg coated in a caustic curing mixture. 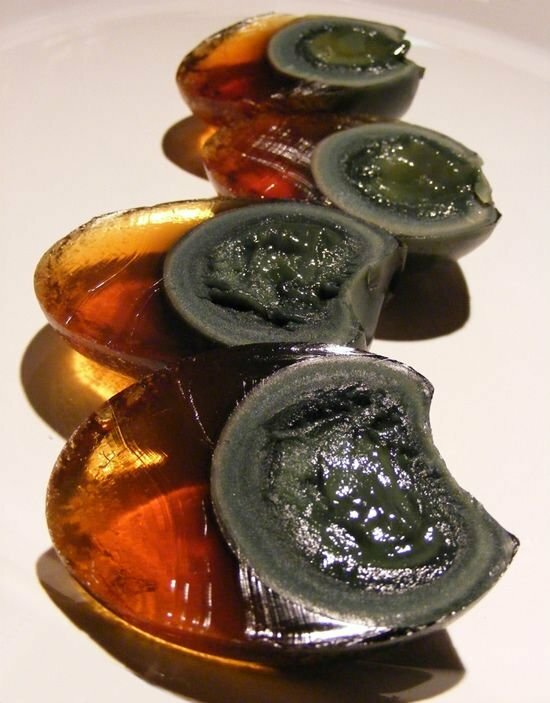 The traditional method for producing century eggs is a development and improvement from the aforementioned primitive process. Instead of using just clay, a mixture of wood ash, quicklime, and salt is included in the plastering mixture, thereby increasing the pH and sodium content of the clay mixture. This addition of natural alkaline compounds improved the odds of creating century eggs instead of spoilage and also increased the speed of the process. A recipe for creating century eggs through this process starts with the infusion of three pounds of tea in boiling water. To the tea, three pounds of quicklime (or seven pounds when the operation is performed in winter), nine pounds of sea-salt, and seven pounds of wood ash from burned oak is mixed together into a smooth paste. Each egg is then individually covered by hand, with gloves being worn to prevent the corrosive action of the lime on skin. 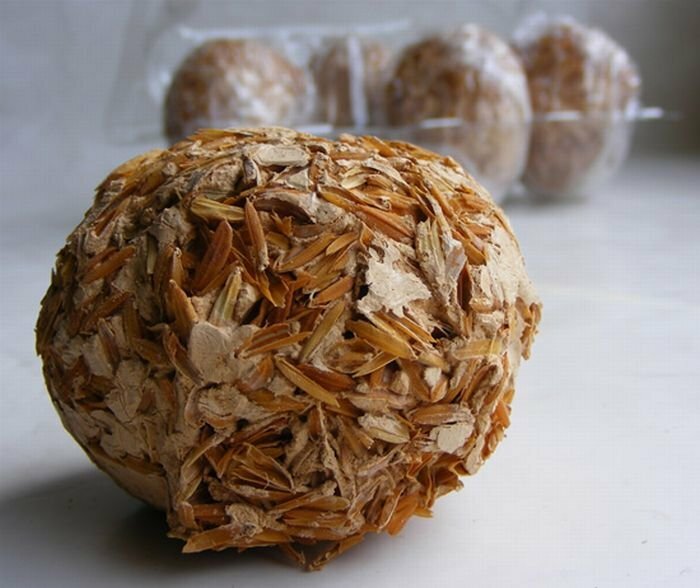 Each egg is then rolled in a mass of rice chaff to keep the eggs from adhering to one another before they are placed in cloth-covered jars or tightly woven baskets. In about three months, the mud slowly dries and hardens into a crust, and then the eggs are ready for consumption. Even though the traditional method is still widely practiced, modern understanding of the chemistry behind the formation of century eggs has led to many simplifications in the recipe. For instance soaking the eggs in a brine of salt, calcium hydroxide, and sodium carbonate for 10 days followed by several weeks of ageing while wrapped in plastic is said to achieve the same effect as the traditional method. This is true to the extent that egg curing in both new and traditional methods is accomplished by introducing alkali hydroxide ions and sodium into the egg. 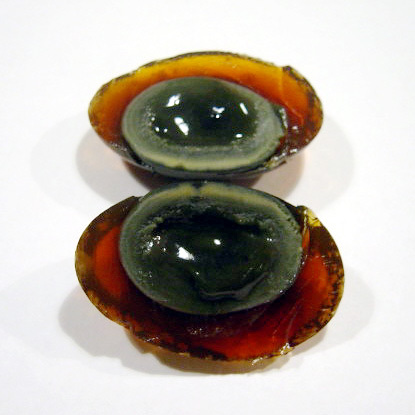 Century eggs can be eaten without further preparation, on their own as a side dish. As an hors d'œuvre, the Cantonese wrap chunks of this egg with slices of pickled ginger root (sometimes sold on a stick as street food). A Shanghainese recipe mixes chopped century eggs with chilled tofu. 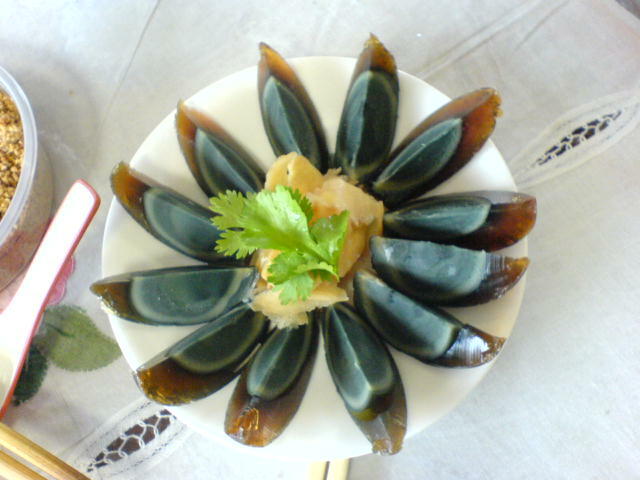 Left: Arranged century egg on a plate. 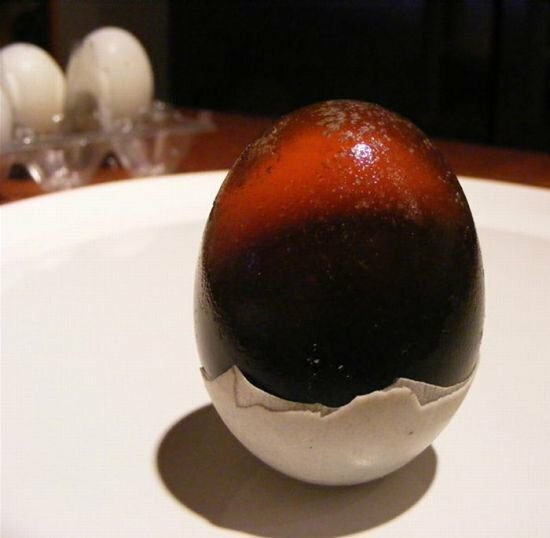 In Taiwan it is popular to eat century eggs on top of cold tofu with katsuobushi (dried skipjack tuna flakes), soy sauce, and sesame oil in a style similar to Japanese Hiyayakko. 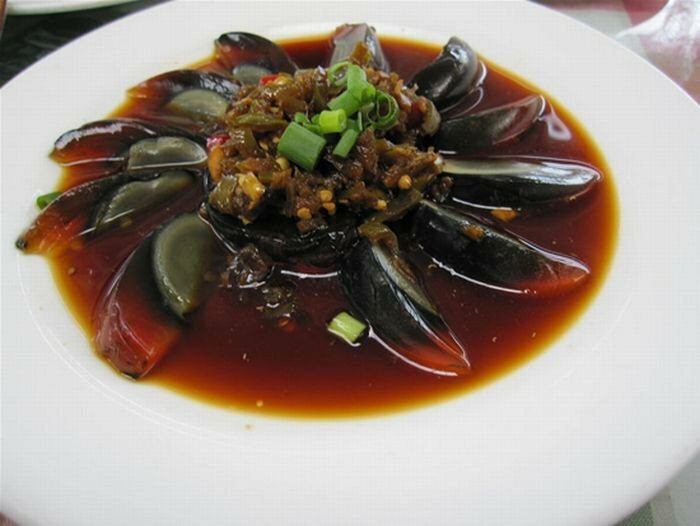 A variation of this recipe common in northern China is to slice century eggs over chilled silken (soft) tofu, adding liberal quantities of shredded young ginger and chopped spring onions as a topping, and then drizzling light soy sauce and sesame oil over the dish, to taste. They are also used in a dish called old-and-fresh eggs, where chopped century eggs are combined with (or used to top) an omelet made with fresh eggs. 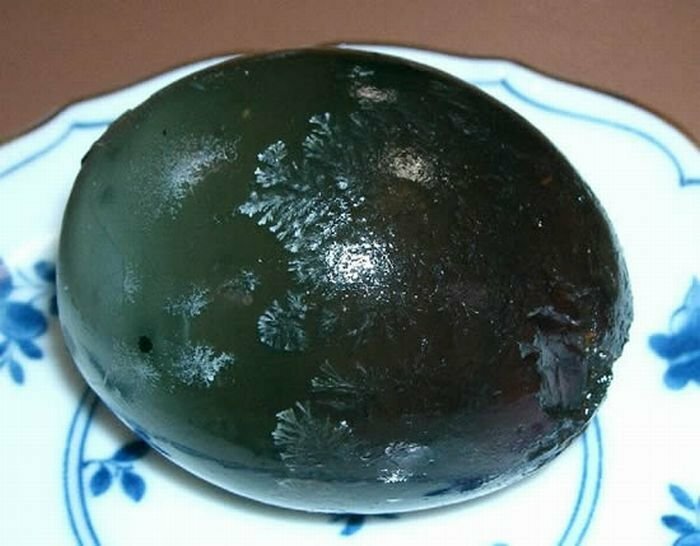 Century egg showing snow-flake/pine-branch patterns.